Founded by the Spanish in 1519 in the stunning natural setting of a bay, Havana soon became the largest and the best-protected port in the Caribbean region and a necessary stopping-point during crossings between the Old and New Worlds. The city’s Plaza Vieja (Old Square) is the fruit of the first attempt at urban planning in this part of the world, combining different styles - baroque, neoclassical, art nouveau - in an authentically Cuban composition. The homogeneous ensemble of private houses with arcades, balconies, wrought-iron gates and internal courtyards represents an architectural style that is the most representative of this synthesis of various cultures crisscrossing in the Caribbean. Old Havana was inscribed on the World Heritage List in 1982. A year later, UNESCO launched a safeguarding campaign to give back authentic character to the Plaza Vieja and its buildings. 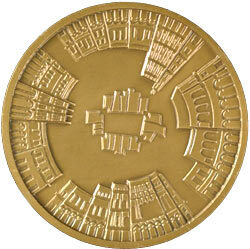 The commemorative medal was struck in 1986 based on a design by Cuban artist Luis Miguel Valdés. The obverse shows a circular view of the square surrounded by its historic buildings. 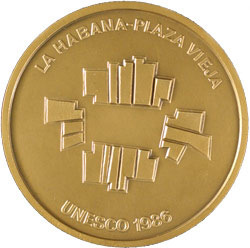 The reverse has a stylized map of the square with the inscription La Habana – Plaza Vieja, UNESCO 1986.